Londonewcastle, a London-based developer, has been creating award-winning developments in the capital for three decades. Their style is to choose bespoke architecture and design in order to deliver schemes that create new benchmarks in their respective neighbourhoods. This extensive regeneration scheme in the heart of Whitechapel required a highly collaborative approach to the design, particularly between Scotch and the two architects, Adjaye Associates and PLP Architecture. The scheme, comprising 12 buildings ranging from 2 to 23 storeys, showcases unique architectural and structural designs resulting in an improved and dynamic residential landscape. The basement design is key to linking the buildings and the site together. Our design approach included a services ‘super-circuit’ that linked satellite plant rooms to a single main plant zone and energy centre. A key consideration was maintaining sufficient head height for car parking whilst taking into account the ‘blue roof’ attenuation system located between the landscaping and the basement structure. Local policy requires the scheme to target a 45% reduction in CO2 emissions over Part L 2013, which is more onerous than the current London Plan requirement of a 35%. Through workshops and thermal modelling of the individual buildings, we developed an energy strategy prioritising the use of passive and energy efficient design measures, further supported by CHP – combined with a large thermal store – and PV. Balfron Tower, a Grade II Listed 27-storey building, is an iconic symbol of ‘Brutalist’ architecture, designed by the celebrated architect Ernö Goldfinger in the 1960s. 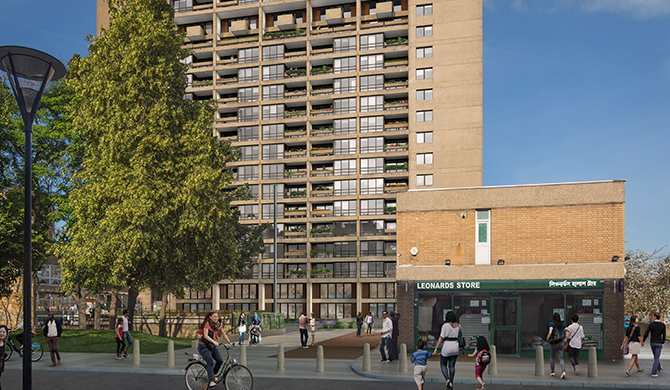 Now in a state of decline, Balfron Tower is undergoing refurbishment and enhancement to re-provide 146 high quality homes and community ‘rooms’ that will meet today’s living standards, whilst preserving and celebrating the history of the building. Working closely with the architects, Studio Egret West and Ab Rogers Design, we have developed solutions that will enable the fabric of the building to be substantially upgraded in terms of ventilation, thermal efficiency and external noise ingress. This includes the design of a bespoke acoustically treated ventilator-type system by our acoustic engineers. Balfron Tower was designed by Goldfinger to promote a sense of community living and as such provided a level of ‘sustainable living’ for its occupants. The project team are keen to retain this ethos and are targeting an ‘Excellent’ rating under BREEAM Domestic Refurbishment, with the energy performance potentially aligned with an ‘Outstanding’ rating. 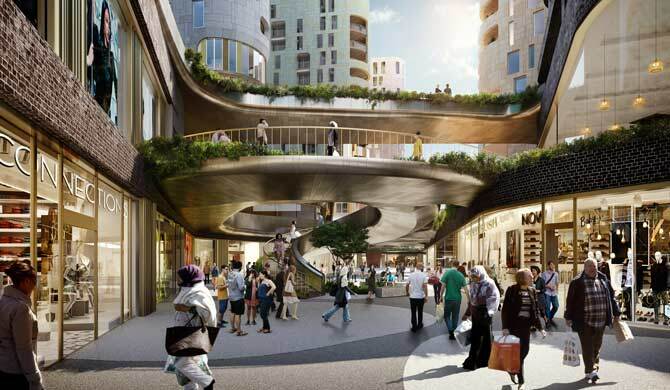 Led by the architect, Studio Egret West, masterplan proposals have been developed to regenerate the site of an aging shopping centre to create a mixed-use scheme comprising new retail, leisure, and community uses plus up to 850 residential units. This strong mix of uses ensures an optimal use of the site during day and night time, but requires careful consideration with regards to building services design in order to minimise intrusion yet permit full accessibility where required. Our design focused on site-wide infrastructure and space-planning of plant locations and services distribution. Although the current energy strategy allows for an onsite energy centre and heat network, Scotch have met with the delivery team at the local authority to initiate early discussions regarding potential connection of the Development to the Barking Town Centre Heat Network, which is currently under construction. We will continue to liaise with the local authority to understand whether connection would be economically and technically viable for our Client. In recognition of the project team’s aspirations, sustainability principles have been used to guide the development of a Framework Sustainability Strategy, prepared by Scotch. These are based on the 10 BioRegional “One Planet Living” principles which are internationally recognised as a way of guiding sustainable development. 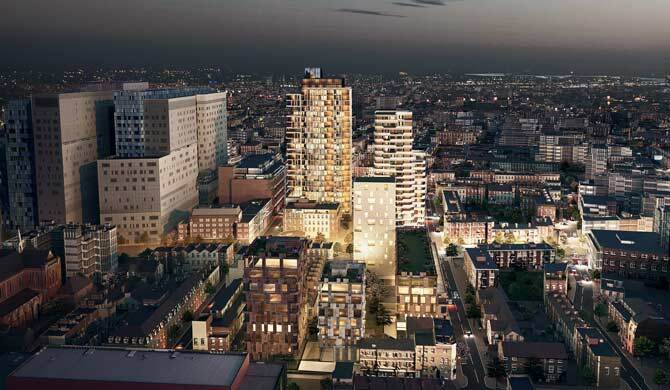 The principles have been adapted to suit the nature of the redevelopment, the site location and the way the Development will be operated and maintained going forward. 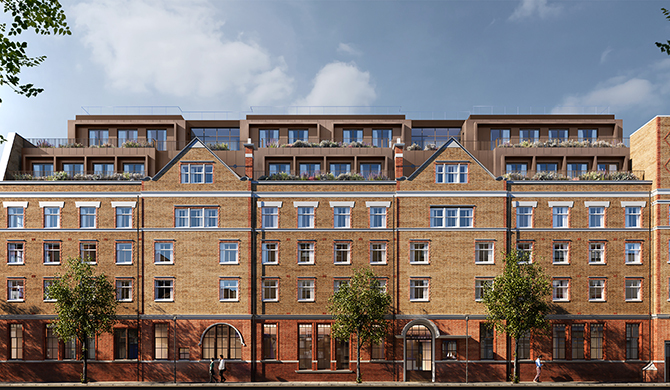 Chapter House, previously named Parker House, a 5-storey building dating from the late 19th Century, is currently undergoing a major demolition and rebuild to provide 40 contemporary, high-end apartments. As the front elevation is considered as making a positive contribution to the Seven Dials Conservation Area, this façade is to be retained and incorporated into the new scheme. Our work has involved designing efficient routes for incoming services to the basement plant and air intakes to supply the apartments with mechanical ventilation whilst not compromising the integrity of the retained building fabric. Centralised plant to provide heating, hot water and cooling ensures that plant at roof level is negligible, allowing an extensive PV array to be installed to help meet the challenging CO2 reduction target. This, together with other sustainable solutions, will also contribute to the scheme’s target of ‘Excellent’ certification under BREEAM Domestic Refurbishment.